Lost Canyon Winery had true gargariste origins. 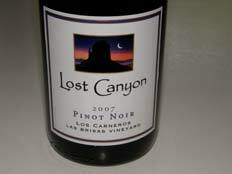 Started in a garage in the Montclair Hills of California in 1978, Jack States and Randy Keworth eventually teamed up with Bob Riskin and the Lost Canyon Winery was bonded in 2001. An urban winery was established in a renovated vintage 1900s warehouse on the San Francisco Bay waterfront south of Jack London Square in Oakland. 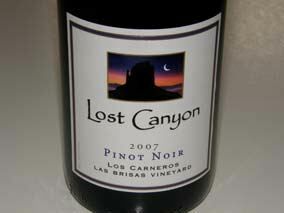 Lost Canyon was one of fifteen wineries part of the East Bay Vintner’s Alliance. I was a fan since the first release in 2001. The wines showed excellent consistency from vintage to vintage. The owners had long-term contracts with the same three Pinot Noir vineyards contributing to the uniformity. 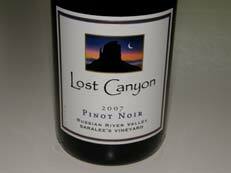 The winery focused on 2,500 cases of small-lot Pinot Noir, Syrah, and Viognier from cool-climate vineyards in the Russian River Valley, Los Carneros and Sonoma Coast appellations. The owners eventually lost interest in continuing the winery and their offspring had no interest in taking over. 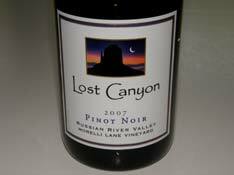 The Lost Canyon Winery brand was sold in 2008 to Fritz Winery in Cloverdale, CA. The new owners Clayton Frtiz and his winemaker Brad Longton fell in love with Lost Canyon wines and are committed to retaining their unique style, sourcing the same vineyards and using the same cooperages. The winery opened a tasting room and wine bar (Station 1870) in downtown Santa Rosa at 123 4th St. Tasting is available Weds through Sun 10:00 - 4:00. Wines are also offered from the sister labels, Fritz, Jenner (Chardonnay and Pinot Noir), and Vino Valpredo. I have not sampled the wines since the takeover. 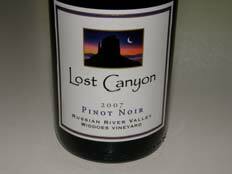 Pinot Noir, Syrah and Chardonnay are produced under the Lost Canyon label.